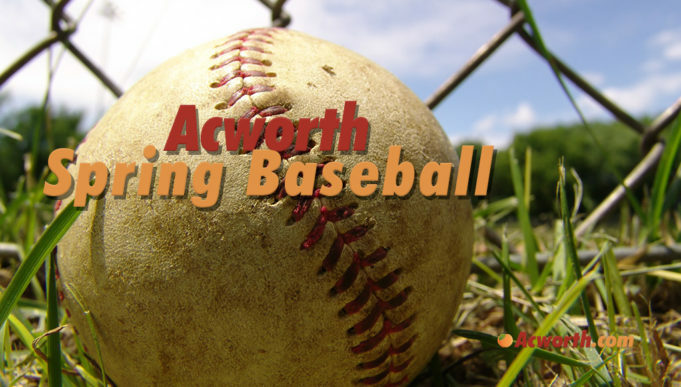 Acworth Baseball registration for the Spring 2019 season is now underway. The association provides a safe, challenging, and most of all, fun instructional and competitive baseball experience for boys and girls, ages 4 to 19. The goal is to instill in the children of this community the ideas of good sportsmanship, honesty, loyalty and a sense of teamwork so that they may become strong, healthy, well-adjusted members of the community. Register today at www.acworthbaseball.org. Sign Up for Spring Baseball Today! Acworth, Ga. The Acworth Baseball Association is currently accepting online registration for the 2019 Spring Baseball Season at www.acworthbaseball.org. We provide a safe, challenging and most of all, fun instructional and competitive baseball experience for boys and girls, ages 4 to 19. Our goal is to instill in the children of this community the ideas of good sportsmanship, honesty, loyalty and a sense of teamwork so that they may become strong, healthy, well adjusted members of the community. An on-site registration day will take place on January 5, 2019 at Roberts School Community Center from 10:00 a.m.-12:00 p.m. Fees vary depending on the age of the participant. All registration fees, age group information, and additional information are posted at www.acworthbaseball.org. Come join one of the best youth baseball programs around!